On 28 December 2018, the last in 2018 session of the Holy Synod of the Russian Orthodox Church began its work in conference hall of the Holy Synod at the Patriarchal and Synodal residence in Danilov Monastery in Moscow. His Beatitude Metropolitan Onufry of Kiev and All Ukraine; Metropolitan Juvenaly of Krutitsy and Kolomna; Metropolitan Vladimir of Kishinev and All Moldova; Metropolitan Alexander of Astana and Kazakhstan, head of the metropolitan area in the Republic of Kazakhstan; Metropolitan Vikenty of Tashkent and Uzbekistan, head of the metropolitan area in Central Asia; Metropolitan Varsonofy of St. Petersburg and Ladoga, chancellor of the Moscow Patriarchate; Metropolitan Pavel of Minsk and Zaslavl, Patriarchal Exarch of All Belarus; and Metropolitan Hilarion of Volokolamsk, chairman of the Moscow Patriarchate’s Department for External Church Relations are permanent members of the Holy Synod. 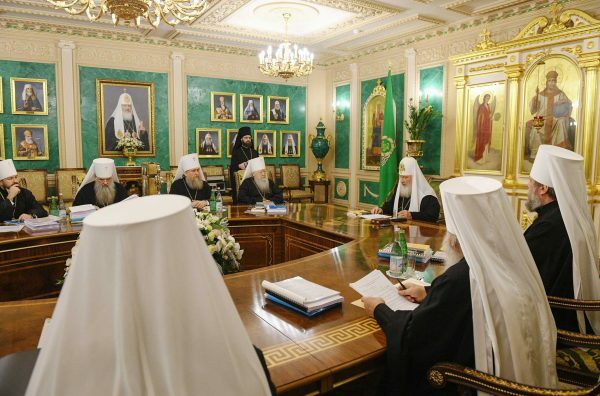 Invited to the winter session (September-February) were Metropolitan Luka of Zaporozhje and Melitopol, Metropolitan Sergy of Barnaul and Altai, Bishop Lazar of Narva and Prichudje, Bishop Veniamin of Rybinsk and Danilov, and Bishop Nikolai of Nakhodka and Preobrazhenka.